I am pretty sure most of you already know that the upcoming OnePlus 6t will most likely not have an headphone jack. According to OnePlus Co-founder Carl Pie, one of the reasons for removing the headphone jack is to create enough space to increase the battery capacity of the device. He however didn't mention the battery capacity of the upcoming device. A new image of what is rumoured to be the battery of the OnePlus 6T has just been leaked on Chinese social media platform, Weibo. 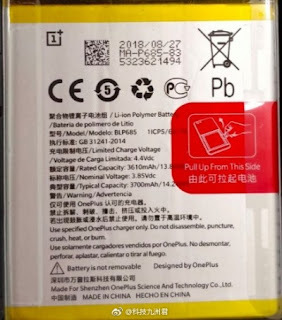 Going by that image, the OnePlus 6t will have a 10% larger battery than the OnePlus 6, with a capacity of 3,700mAh. This is however still rumours and can't really be confirmed yet until the official unveiling of the device. The OnePlus will most likely be powered by Qualcomm's Snapdragon 845 chipset coupled with a 6GB or 8GB RAM with storage options of 64GB and 256GB. The device will also come with an in-screen fingerprint reader instead of the traditional rear mounted fingerprint as found on the OnePlus 6. The official announcement of the OnePlus 6t will be on the 17th of October which is about 2 weeks away.